Design a personal trip with more than 450 hotels. Visit 09 countries in 16 days- Italy (Rome, Pisa, Viareggio, Florence, Venice), Vatican City, Austria (Innsbruck), Liechtenstein (Vaduz), Switzerland (Interlaken, Lucerne), Germany (Heidelberg, Bensheim, Cologne), Netherlands (Amsterdam), Belgium (Brussels), France (Paris). Services of professional & friendly Tour Manager, providing you with practical support throughout the trip. 02 nights Rome, 01 night Pisa, 02 nights Venice, 01 night Innsbruck, 03 nights Zurich, 01 night Bensheim, 02 nights Zoetermeer, 03 nights Paris. 15 continental breakfasts, 13 delicious lunches & 15 dinners. Enjoy Illumination tour of Rome, Florence and Venice and Paris. Guided visits to the enormous Vatican Museum & Sistine Chapel. Excursion to Viareggio, a beach vacation in the middle of Tuscany Region. Visit San Lorenzo market for local shopping experience. Romantic gondola ride through the canals of Venice. Enjoy dinner on boat in Venice. Orientation tour of Innsbruck, Lucerne, Interlaken, Heidelberg, Brussels. Visit Mt. Titlis with ride in the world’s first ever revolving `ROTAIR` gondola. Cruise to the heart of Lake Lucerne with Swiss Folklore & Indian dinner. Take a cruise down the Rhine River from St. Goar to Boppard. Visit to Madurodam- Holland in miniature built on 1-25 scale. Enjoy romantic cruise on River Seine. Visit 06 Places in 7 days- Switzerland (Zurich, Interlaken, Lucerne), Germany (Heidelberg, Bensheim), France (Paris). 01 nights accommodation in Bensheim, Germany. 06 continental breakfasts & 06 delicious Indian dinners. View the magnificent Rhine Falls with boat ride at Falls. Orientation tour of Heidelberg with Heidelberg Castle entrance. Enjoy bird’s eye view of Paris from 56th Floor of Montparnasse Tower. Enjoy the panoramic view of Paris from the 3nd level of Eiffel Tower. Day 1 : Zurich On arrival in Zurich, you will be met and transferred to your hotel. Check-In and rest for some time. After that, you will explore the history, culture and tradition of Zurich on this classic trolley tour combined with the visit to the Swiss National Museum. See all the top attractions of Zurich, which includes Old Town, Bahnhofstrasse and the famous Chagall windows on the joyride through the city in the old-time trolley. Overnight at Zurich. Day 2 : Zurich - Lucerne After breakfast, meet your car driver that will take you to the train station where you will take the train to Lucerne. Check-In the hotel and rest for some time. After that, you will proceed to Mount Titlis Eternal Snow Half-Day Trip. Explore the highest suspension bridge, enjoy a cliff walk and Titlis rotair gondola. See Titlis Glacier Park, Ice flyer chairlift and Glacier Cave. Overnight at Lucerne. Day 3 : Lucerne - Interlaken After breakfast, meet your car driver that will take you to the train station where you will take the train to Interlaken. Check-In the hotel and rest for some time. In the evening, you will proceed to Interlaken Swiss Food and Culture Walking Tour. Explore old traditions and modern processes of farming and relish some fresh cheese and milk produced there. You can watch the woodcraft put on display and see the skilled workers at work. Next, visit the Funky Chocolate Club and explore the traditional art of Swiss chocolate making. Overnight at Interlaken. Day 4 : Interlaken After breakfast, visit to Lake Thun And Lake Brienz. Explore the beauty of crystal lakes, offers multiple scenic spots. You'll also enjoy a boat ride over the turquoise water and admire the stunning views of the surrounding. In the evening, you will visit the Harder Kulm. Admire the unique view of the surroundings from the Two Lakes Bridges. Overnight at Interlaken. Day 5 : Interlaken - Rome After brekfast, meet your car driver that will take you to the train station where you will take the train to Rome. Check-In the hotel and rest for some time. After that, you will visit the Campo De’ Fiori. You can also see the finest bars, restaurants, and luxury shops that make it an ideal place to hang out. Overnight at Rome. Day 6 : Rome After breakfast, visit to Piazza Navona. You can see the famous Gian Lorenzo Bernini's famous Fountain of the four Rivers, with an Egyptian obelisk sitting atop the sculpture at the center of the Piazza Navona. Admire two other smaller fountains, one at each end of the piazza, both by Giacomo della Porta. In the evening, you will visit the Largo di Torre Argentina. Explore the Theater of Pompey, said to be the site of Julius Caesar’s assassination. Overnight at Rome. Day 7 : Rome - Florence After breakfast, meet your car driver that will take you to the train station where you will take the train to Florence. After that, you will proceed to Giotto’s Bell Tower. Explore the florentine Gothic architecture and is one of the most important monuments on the Piazza del Duomo in Florence. Next, visit the Basilica Of Santa Croce. Explore the two main tombs in the chapel are those of Lorenzo and Giuliano Medici. Overnight Florence. Day 8 : Florence - Venice After breakfast, meet your car driver that will take you to the train station where you will take the train to Venice. Check-In the hotel and rest for some time. After that, you will visit Doge's Palace. See the wonderful art (paintings by Titian, Tintoretto and Veronese), majestic staircases, the Doge's apartments, the government chambers, the prison cells and the Bridge of Sighs. Overnight at Venice. Day 9 : Venice After breakfast, visit to Basilica Of St. Mark. You can see the wonderful architectural flurry of Gothic, Byzantine, Romanesque and Renaissance styles declaring the wealth of Venice over centuries, and a spiritual place of worship. Next, you will proceed to Murano, Burano and Torcello Half-Day Sightseeing Tour. Your first stop will be at a glass-blowing factory on Murano, then visit Venice's first cathedral on the tranquil island of Torcello which will be followed by a visit to Burano famous for its handcrafted lace. Overnight at Venice. Day 10 : Venice - Paris After breakfast, Transfer on your own to the airport for your flight to Paris. Check-In the hotel and rest for some time. In the evening, you will proceed to GPS Audio-Guided Paris By Night Tour. See the famous sights such as Notre Dame and the Ile de la Cité, the Pont Alexandre III, Invalides and the Rodin Museum, École Militaire and the Champ de Mars, the Eiffel Tower and many more. Overnight at Paris. Day 11 : Paris After breakfast, proceed to Big Bus Paris Hop-On Hop-Off Tour. You can see top Paris attractions including the Eiffel Tower, Louvre, Notre-Dame Cathedral and Moulin Rouge. Rest of the day at leisure. In the evening, you will proceed to Montmartre By Night Driving. You can see Louvre, Arc de Triomphe, Place de la Concorde, Opera Garnier, Vintage 2CV, Moulin Rouge, windmill, Pigalle district and perform climbing up to Montmartre and zipping down the Champs Elysees. Overnight at Paris. Day 12 : Paris After breakfast, visit the Montparnasse Tower Observation Deck. After that, you will proceed to Louvre Museum Walking Tour Including Venus De Milo And Mona Lisa. Explore the wonderful collection of architecture, paintings, and sculpture. Overnight at Paris. Day 13 : Depart After breakfast at the hotel, proceed on your own to the airport for your flight, to back home. Day 1 : Arrive in Rome Meals- Dinner. Welcome to Rome, the historical city of Italy. On arrival at airport, receive a warm welcome and then transfer you to your hotel in Rome. Upon arrival, check in and relax in the hotel. Today evening proceed for an Illumination tour of Rome. Enjoy the views of Pantheon Church, Colosseum, Piazza Navona - one of the most famous and arguably the most beautiful of Rome's many squares and Trevi Fountain. Later enjoy dinner in an Indian restaurant. Overnight stay in the hotel. Day 2 : Rome Meals- Breakfast, Lunch & Dinner. After breakfast, proceed for the guided tour of Vatican City with Sistine Chapel. See the highlights of Vatican Museum. A treasure trove of incredible art and architecture, the museums are the highlight of most Vatican visits. Stroll through the corridors to view the world's largest private art collection, once intended exclusively for the pope. Thereafter, amble through Raphael's Rooms before visiting the breathtakingly beautiful Sistine Chapel, which is considered the pope's home chapel. Walk through this sacred Vatican site to see Michelangelo's astounding frescoes, The Creation of Adam and The Last Judgment. The last part of your small-group Vatican tour focuses on St Peter's Basilica, with its distinctive 450-foot-high (137-meter) dome. St Peters Basilica is said to stand on the ground where St Peter the Apostle was crucified and buried. In the afternoon, enjoy lunch in an Indian restaurant. After lunch have some free time for leisure. In the evening learn the traditional ways of cooking Italian pizzas, a true Italian culinary experience, followed by dinner. Overnight stay in the hotel. Day 3 : Rome – Pisa Meals- Breakfast, Lunch & Dinner. Today after breakfast, drive all the way to Pisa enjoying scenic journey. En-route you will enjoy lunch at an Indian restaurant. Explore Pisa on an orientation tour with a view of iconic Leaning Tower of Pisa. Later proceed to Viareggio, a popular seaside town situated on the Tuscany coast, just 20 km from Pisa. The sandy beach of Viareggio falls gently into the sea, ideal for children, is spacious, clean and outrageous. Alongside runs the promenade with boutiques, shops, cafés, discos, cinemas, art-galleries and much more for your entertainment. Tonight, enjoy Indian Dinner. Overnight stay in the hotel. Day 4 : Pisa – Florence – Padova Meals- Breakfast, Lunch & Dinner. After a healthy breakfast, depart for Venice – known as the ‘City of Canals’ via Florence. Arrive Florence & enjoy the guided tour of the city followed by Indian lunch. Your tour starts with Piazzale Michelangelo to admire wonderful panoramic views of Florence. Next, you'll take a walking tour of the cathedral (exterior) in the old city center, including Giotto's bell tower, the Baptistry with its bronze doors and a visit to Duomo Santa Maria Del Fiore. Later you will be dropped at the market of San Lorenzo for a local shopping experience. Later drive to Padova. In the evening, enjoy sumptuous dinner in an Indian restaurant. Overnight stay in the hotel. Day 5 : Padova - Venice Island - Padova Meals- Breakfast, Lunch & Dinner. After breakfast, enjoy the guided tour of Venice Island followed by the romantic gondola ride. Enjoy an unforgettable gondola ride through the smaller canals for an insight into the lives of people of this lagoon city. Afternoon enjoy local lunch. After lunch, enjoy free time at leisure. Evening enjoy dinner on a boat on your last day in romantic Venice. Overnight stay in the hotel. Day 6 : Padova-Wattens-Innsbruck Meals- Breakfast, Lunch & Dinner. After a sumptuous breakfast proceed to Innsbruck. Innsbruck - the Capital of the Alps - was two-time host of the Olympic Winter Games (1964 and 1976) and has a history of 800 years. The city offers art treasures and is famous for buildings such as the Golden Roof, the Hofburg and Ambras Castle. Upon arrival proceed for lunch at an Indian restaurant. Thereafter, leave for Wattens to visit the world famous Swarovski Crystal Museum & Showroom. Enjoy shopping to your heart’s content. Evening enjoy an orientation tour of Innsbruck including Golden Roof, Hofburg, Hofkirsche, St. Annes Column, Stadtturn, Helblinghaus, Triumphpforte. Later proceed for dinner in an Indian restaurant. Overnight stay in the hotel. Day 7 : Innsbruck – Vaduz - Zurich Meals- Breakfast, Lunch & Dinner. Today morning after breakfast, depart for Vaduz. You can also opt for Tram ride in Vaduz. Created by Daniel Real, the city train is an unmissable experience for guests of all ages. Then proceed to Götzis for lunch in an Indian restaurant. Thereafter, drive to Schaffhausen to view the magnificent Rhine Falls, largest in Europe. Later drive to Zurich. Upon arrival, enjoy dinner. Evening is free to explore the city on your own. Overnight stay in the hotel. Day 8 : Zurich – Mt. Titlis – Lucerne – Zurich Meals- Breakfast, Lunch & Dinner. After breakfast, depart for a full day excursion to Mt. Titlis - which offers snow and ice experience on the highest viewpoint in central Switzerland. Board the aerial cableway for a 45 minute journey from the green valley bottom to the high alpine glacier region at 3020m/10000 ft which guarantees snow the whole year round. Enjoy a magnificent ride in the world’s first ever revolving `ROTAIR` gondola, which offers a 360° panoramic view into the Alps. Visit the Ice Grotto and experience the new `Ice Flyer`, a chair lift which rides over the glacier with fantastic views into crevasses and ice falls. Newly opened, an exciting Titlis Cliff Walk awaits you….the spectacular suspension bridge high up on the summit. 3041 metres above sea-level! 500 metres off the ground! 150 heart pounding steps! To cross the bridge, you'll need nerves as strong as the steel cables from which it hangs. The TITLIS Cliff Walk holds the record for being the highest suspension bridge in Europe. Don’t forget to enjoy a snow slide on the `Fun lift`. Afternoon enjoy lunch at Trubsee. After lunch proceed for orientation tour of Lucerne visiting the Chapel Bridge, Lion monument and old city squares. Later visit the biggest jeweler in town, Bucherer, famous for its watches and luxury goods. You cannot miss Casa Grande & Sturzenneger for handicrafts and embroideries. In the evening, enjoy cruise on Lake Lucerne with Swiss folklore and Indian dinner. All the guests are invited to participate in the session. Overnight stay in the hotel. Day 9 : Zurich – Interlaken – Zurich (Optional tour of Jungfraujoch with lunch) Meals- Breakfast, Lunch & Dinner. After breakfast, day is free or you can opt for an excursion to Jungfraujoch- top of Europe which is at 3`454 m /11`333 ft. Board the cogwheel train for the most interesting mountain train trip, via Kleine Scheidegg, at the foot of the famous Eiger North Face to Jungfraujoch - Europe’s highest railway station. Enjoy the incredible world of eternal snow and ice. Visit the Ice Palace, experience the breathtaking panoramic views from the Sphinx Observation Terrace overlooking the Aletsch Glacier (Europe’s longest glacier) and the snow-capped peaks of the neighboring countries. In the evening, proceed for an orientation tour of Interlaken. After a hearty dinner proceed to your hotel in Zurich. Overnight stay in the hotel. Day 10 : Zurich-Titisee-Heidelberg-Bensheim q Meals- Breakfast, Lunch & Dinner. 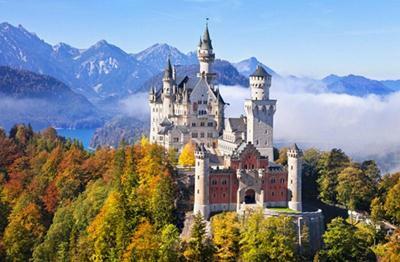 After breakfast, start your journey to Germany through the famous Black Forest region. Take a stop at the Drubba - in the heart of the forest. Enjoy the tour of Cuckoo clock workshop. Here you have an opportunity to buy Cuckoo clocks & other souvenirs. You also have an opportunity to eat the famous Black Forest Cake. After enjoying lunch, drive to Heidelberg. Enjoy orientation tour of the city. Thereafter, proceed to Bensheim for Indian dinner. Overnight stay in the hotel. Day 11 : Bensheim-Boppard-Cologne-Zoetermeer Meals- Breakfast, Lunch & Dinner. After breakfast, depart to St Goar for 1 hour cruise to Boppard. Arrive Bopard & proceed to Cologne. View Cologne Cathedral from the outside. Later, enjoy lunch at Indian restaurant. After lunch, proceed to Hague. Arrive Hague & visit to Madurodam - Holland in miniature. Feel like a giant amidst models of palaces, canals, windmills, harbors, airports. The canal houses of Amsterdam, the Alkmaar cheese market and parts of the Delta Works are all replicated in minute detail on a 1-25 scale. Afterwards proceed to an Indian restaurant for dinner. After dinner, proceed to Hotel in Zoetermeer. Overnight stay in the hotel. Day 12 : Zoetermeer-Amsterdam-Zoetermeer Meals- Breakfast, Lunch & Dinner. After breakfast, drive to Amsterdam. Discover Amsterdam in a novel manner as we take you on a cruise along its canals, the best way to see this captivating city. Later proceed for an orientation tour of the city. Afternoon enjoy delicious Indian lunch. Later, enjoy a demonstration on the art of making wooden shoes, at Ratterman’s Factory. Avail of the opportunity to shop for wooden shoes and other Dutch souvenirs. On your way you will stop off at a cheese factory, where Dutch cheeses are still being made in the traditional way. Enjoy Indian dinner in Hague. Overnight stay in the hotel. Day 13 : Zoetermeer - Brussels - Paris Meals- Breakfast, Lunch & Dinner. After breakfast, drive towards Brussels for an orientation tour. See the adorable Manneken Pis Statue, a charming fountain of a little boy, today the symbol of Brussels, the beautiful Grand Place, the Town Hall, Municipal Museum, the Royal Palace, St. Michael’s Cathedral and the mammoth Palace of Justice. Next, enjoy lunch at an Indian restaurant & drive to Paris – the romantic city of Europe, also known as the 'City of Lights'. Upon arrival, check-in to your hotel. Overnight stay in the hotel. Day 14 : Paris Meals- Breakfast, Lunch & Dinner. Breakfast at the hotel. Today morning proceed for a guided city tour of Paris – enjoy a visit to Notre Dame Cathedral and the Arc de Triomphe, drive through the famous Champs Elysees, Place de la Concorde, Chaillot Palace and the Louvre. Afternoon enjoy lunch at an Indian restaurant. After lunch proceed for a romantic cruise on River Seine & visit to the Eiffel Tower. In the evening proceed for dinner. Today’s delight will be authentic Indian food. Today you have an option of an evening at the world renowned Lido Show - Enjoy an unforgettable evening at the world renowned Lido de Paris accompanied with a bottle of champagne during the show and be seized by the unique Parisian spirit. Overnight stay in the hotel. Day 15 : Paris Meals- Breakfast, Lunch & Dinner. After breakfast, join us for some fun, adventure and entertainment on our full-day tour to Disneyland. Let your imagination soar and immerse yourself in the never-ending, always fascinating world Disneyland. On entering the Disneyland Theme Parks, an enchanting kingdom filled with fun, fantasy and discovery will open before your eyes, a world of make believe characters, shows and attractions. Overnight stay in the hotel. Day 16 : Depart Paris Meals- Breakfast. Today morning after breakfast transfer to airport to board your flight back home or onward destination. Day 1 : Arrive Zurich Meals- Dinner. Enter through Switzerland – the heart of Europe, known for its scenic grandeur, beautiful lakes, and impressive snow - clad mountains. On arrival at Zurich airport, receive a warm welcome and transfer you to your hotel in Zurich. Zürich, the largest city in Switzerland reveals something amazing at every corner- architectural highlights, historic squares, streets and districts, churches, works of art and much more. Evening enjoy the city tour of Zurich. Overnight stay in the hotel. Day 2 : Zurich – Lucerne - Zurich (Optional tour to Mt. Titlis with Ice Flyer Ride) Meals- Breakfast, & Dinner. After breakfast, enjoy morning at leisure OR take a trip to Mt. Titlis where you reach after boarding the aerial cableway for a 45 minute journey from the green valley bottom to the high alpine glacier region at 3020m/10000 ft which guarantees snow the whole year round. Enjoy a magnificent ride in the world’s first ever revolving `ROTAIR` gondola, which offers a 360° panoramic view into the Alps. Visit the Ice Grotto and experience the new `Ice Flyer`, a chair lift which rides over the glacier with fantastic views into crevasses and ice falls. Newly opened, an exciting Titlis Cliff Walk awaits you…. The spectacular suspension bridge high up on the summit. 3041 metres above sea-level! 500 metres off the ground! 150 heart pounding steps! To cross the bridge, you'll need nerves as strong as the steel cables from which it hangs. The TITLIS Cliff Walk holds the record for being the highest suspension bridge in Europe. Don’t forget to enjoy a snow slide on the `Fun lift`. In evening, enjoy an orientation tour of Lucerne visiting the Chapel Bridge, Lion monument & old city squares. Visit the biggest jeweler in town is Bucherer, famous for its watches and luxury goods. You cannot miss Casa Grande & Sturzenegger for handicrafts & embroideries. Overnight stay in the hotel. Day 3 : Zurich – Interlaken – Zurich (Optional tour of Jungfraujoch with lunch) Meals- Breakfast, & Dinner. 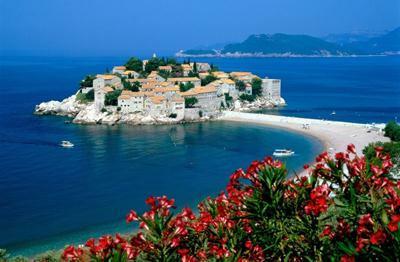 Today after breakfast, day is at leisure to enjoy the scenic beauty of this wonderful country. You can also opt for a full day excursion to Jungfraujoch, known as 'Top of Europe' which is at 3`454 m /11`333 ft. Board the cogwheel train for the most interesting mountain train trip, via Kleine Scheidegg, at the foot of the famous Eiger North Face to Jungfraujoch - Europe’s highest railway station. Delicious Indian lunch will be provided at the peak. Enjoy the incredible world of eternal snow and ice. Visit the Ice Palace, experience the breathtaking panoramic views from the Sphinx Observation Terrace overlooking the Aletsch Glacier (Europe’s longest glacier) and the snow-capped peaks of the neighboring countries. Later proceed for an orientation tour of Interlaken. The land between the lakes Thun and Brienz, Interlaken is one of Switzerland’s oldest and most famous resorts. Finally, enjoy an overnight stay at the comfort of your hotel. Overnight stay in the hotel. Day 4 : Zurich – Lake Titisee – Heidelberg – Bensheim Meals- Breakfast, & Dinner. After breakfast, drive to Schaffhausen to view the magnificent Rhine Falls, largest in Europe. Enjoy a boat ride to get up close and personal to Rhine Falls. Later continue your journey to Germany through the famous Black Forest region. Stop at Drubba in the heart of the forest. Here you have an opportunity to buy Cuckoo clocks & other souvenirs. You also have an opportunity to eat the famous Black Forest Cake. Thereafter, proceed to Heidelberg. Later visit the Heidelberg Castle. Overnight stay in the hotel. Day 5 : Heidelberg - Paris Meals- Breakfast, & Dinner. After breakfast, drive to Paris. Upon arrival, check in to the hotel & relax. This evening enjoy the bird’s eye view of Paris & Eiffel Tower from Montparnasse 56. It takes 38 seconds on an elevator to take you to a height of 196 meters (over 640 ft) to the 56th observation floor of this office skyscraper (Tour Montparnasse), which offers views of the city in all directions. You can spot all Paris landmarks and major attractions, including the Eiffel Tower, Les Invalides, Sacré Coeur, Musée d'Orsay, the Arc de Triomphe, the Panthéon, the Louvre, the Luxembourg garden… The observatory has a café and bar, souvenir shop, outdoor viewing deck and a function room. Evening is free OR you can choose the option of an evening at the world renowned Lido Show - Enjoy an unforgettable evening at the world renowned Lido de Paris accompanied with a bottle of champagne during the show and be seized by the unique Parisian spirit. Overnight stay in the hotel. Day 6 : Paris Meals- Breakfast, & Dinner. Today morning after breakfast enjoy the guided city tour of Paris. Visit to Notre dame Cathedral and Arc de Triomphe, drive through the famous Champs Elysees, Place de la Concorde, Chaillot Palace, Louvre and many more places. Later proceed for a visit to the Eiffel Tower followed by an evening cruise on River Seine. Thereafter, return to the hotel to enjoy your time at leisure. Overnight stay in the hotel. Day 7 : Departure Meals- Breakfast. After a delicious breakfast, say goodbye to Europe & transfer to the airport to board your flight back home or onward destination. Day 1 : Prague On arrival at the Prague airport, our representative will transfer you to the hotel. Check into the hotel and rest of the day is at leisure. Explore the beautiful Prague. Overnight at Prague. Day 2 : Prague After breakfast, you will proceed to City Sightseeing Prague Hop On Hop Off Tour. See the major highlights of the city including Dancing House, St Ciril and Method Church, Charles Square, National Museum and Jewish Quarter. Overnight stay at your hotel. Day 3 : Prague After breakfast, you will visit the Prague Castle and enjoy a cruise on the Vltava river. See the famous attraction including National Theater, the Rudolfinum, the Powder gate, Wenceslas square, Valdstejn Garden, and the Jewish Town. Overnight stay at your hotel. Day 4 : Prague - Vienna After breakfast, meet your car driver that will take you to the train station where you will take the train to Vienna. Check-In the hotel and rest for some time. After that, you will proceed to Vienna City Hop-On Hop-Off Tour. See the top attractions such as Hofburg Palace, the Vienna State Opera, City Hall and Schonbrunn Palace. Overnight at Vienna. Day 5 : Vienna After breakfast, you will proceed to Wachau Tour. 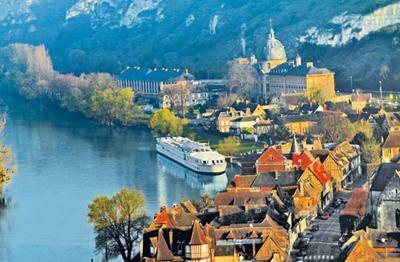 Enjoy a romantic boat cruise on the Blue Danube and find the scenic beauty of the Wachau and Danube Valleys. You'll also explore the medieval village of Durnstein and the charming town of Krems. Overnight at Vienna. Day 6 : Vienna - Budapest After breakfast, meet your car driver that will take you to the train station where you will take the train to Budapest. Check-In the hotel and rest for some time. In the evening, you will proceed to Budapest Night Stroll and Boat Cruise Small Group. The night stroll in the amazing parts of the city provides a magnificent view of the entire place. Overnight at Budapest. Day 7 : Budapest After breakfast, you will proceed to Lake Balaton and visit the Hungarian Sea, enjoying the food and wine of the different towns. You can see the Peninsula Tihany, the famous nature reserve Overnight at Budapest. Day 8 : Depart After breakfast at the hotel, proceed on your own to the airport for your flight, to back home. Day 1 : ARRIVE PARIS Meet and greet at the airport with your driver. Drive to your hotel in Paris. After you have checked in your hotel room, we'll give you some free time to freshen up, enjoy the city on your own and rest for some time. In the evening, you will proceed to GPS Audio-Guided Paris By Night Tour. See the famous sights such as Notre Dame and the Ile de la Cité, the Pont Alexandre III, Invalides and the Rodin Museum, École Militaire and the Champ de Mars, the Eiffel Tower and many more. Overnight at Paris. Day 2 : PARIS After breakfast, proceed to Big Bus Paris Hop-On Hop-Off Tour. You can see top Paris attractions including the Eiffel Tower, Louvre, Notre-Dame Cathedral and Moulin Rouge. Rest of the day at leisure. In the evening, you will proceed to Montmartre By Night Driving Tour. You can see Louvre, Arc de Triomphe, Place de la Concorde, Opera Garnier, Vintage 2CV, Moulin Rouge, windmill, Pigalle district and perform climbing up to Montmartre and zipping down the Champs Elysees. Overnight at Paris. Day 4 : PARIS - BRUSSELS After breakfast meet your car driver that will take you to the train station where you will take the train to Brussels. Check-In the hotel and rest for some time. With this Hop-on Hop-off tour, you can get on and off at any stop an unlimited number of times for a full day's sightseeing. The coach passes all the main sights in the city, including St Michael Cathedral, the Congress Column, the Atomium, Grand Place, Palace of Justice, the Royal Museum of Art and History and the Royal Palace, so you'll be able to see as much as you like in your own time. Overnight at Brussels. Day 5 : BRUSSELS After breakfast, you will visit the Grand Place. See the fine baroque gables, gilded statues and elaborate guild symbols. After that, you will proceed to the Cathedral Of St. Michael And St. Gudula. Explore the beauty and Gothic Architecture in a Holly Place. Overnight at Brussels. Day 6 : BRUSSELS - AMSTERDAM Breakfast at the hotel. Transfer on your own to the train station to board your train for Amsterdam - one of the greatest small cities in the world. Check-In the hotel and rest for some time. In the evening, you will proceed to Amsterdam Dinner Cruise Tour. See a beautiful view of lights and visual effects that will be seen across the city and boats. You'll also enjoy a 4-course deluxe dinner on board with dessert. Overnight at Amsterdam. Day 7 : AMSTERDAM Breakfast at the hotel. You will enjoy a full day tour of Combined City Tour, Volendam, Marken & Windmills. Visit the windmill at the river Amstel and a visit to a diamond factory. You can see a clogmaker and explore the traditional Dutch village. Overnight at Amsterdam. Day 8 : AMSTERDAM After breakfast, proceed to Tuk Tuk Amsterdam City Tour. Visit the Anne Frank House, The Red Light District, The Royal Palace, The Western Church & The Jordan District. Rest for some time. In the evening, you will proceed to Amsterdam Water Colours Cruise Tour. Enjoy a canal cruise during the Amsterdam lights festival with a glass of mulled wine. You can see the top Amsterdam attractions such as Amstel River, City Hall and Skinny Bridge. overnight at Amsterdam. Day 9 : DEPART AMSTERDAM After breakfast at the hotel, proceed on your own to the airport for your flight, to back home. * We also do Flights to Europe at discounted rates. Flight charges vary with Dates. Ques: Why is your Dollar-INR rate Rs 1 higher than existing exchange rate? Ans: Dollar rates are different for buy & sell options. Overseas transactions require a bank charge which is normally Rs 1 higher than the existing rate. Moreover, this rate is applicable on the day of your payment date. Ques: Can I pay full Amount now to avoid the USD-INR Fluctuation? Ans: Yes, In that case full amount shall be charged as per current exchange rate+1 without affecting any future fluctuations in USD Rates. Ques: I am a Non Indian customer & wish to Wire Transfer/Bank Transfer. Would I be charged any costs? Ans: Certain banks may charge between 5-20 USD for overseas transactions. You may enquire this from your respective bank. Kindly note that this charge is borne by you. Ques: Can I pay in any other currency than USD/INR? Ans: You can pay Booking Hold Amount (Token Amount) of 300 USD in 56 different currencies like GBP, Euro, Yuan etc. However, Booking Confirmation & Booking Full Balance Amount needs to be transferred in USD/INR by Bank Transfer/Wire Transfer Only. You can simply contact your bank to convert your currency into USD. Ques: I am a Non Indian customer & wish to pay everything via Credit Card. Is it possible? Ans: You can pay Booking Hold Amount (Token Amount) of 300 USD through credit card. 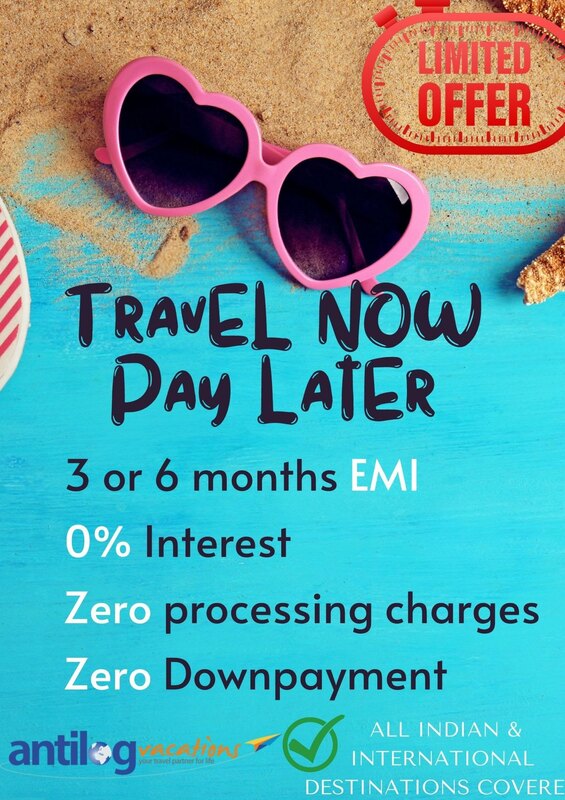 However, Booking Confirmation & Booking Full Balance Amount needs to be paid by Bank Transfer/Wire Transfer Only. Ques: Who will make my bookings & whom do I need to contact after bookings? Ans: Once your bookings are made, they are automatically diverted to the Post Sales department for processing. They are the ones to send you vouchers, Receipts & Invoices & shall contact you automatically. You can contact them at Vouchers: vouchers@antilogvacations.com Receipts/Invoices: accounts@antilogvacations.com with your booking ID regarding payment information, queries & amendments. Ques: Is the payment on your website safe? Ans: We don’t record any details of your card information. All transactions are carried with 3rd party associates who provide 100% security guarantee for your transactions. Ques: Would you give us any receipt of the booking hold amount? Ans: Yes, you will get receipt for every payment done to Antilog Vacations. The receipt will be mailed to your email id registered with us. Ques: Can this 25% (Booking Confirmation) amount vary? Ans: Yes, In peak seasons some hotels may ask for 100% Booking confirmation amount to confirm the bookings or certain activities may be charged full in advance. To avoid rush & last minute non availability, we can ask for a higher booking confirmation amount than 25%. Ques: Can this Booking Confirmation Amount and Booking full balance amount be paid via Payment gateway or Via Credit Card through PayPal (For Overseas customers)? Ans: NO, we don’t accept full payments via Credit Card from Overseas customers. Remaining amount needs to be deposited in our Foreign Currency account via Wire transfer/Bank Transfer. This facility can be easily availed through most of the banks across the world. It takes normally 3-4 days for payments to reach us. Once we receive payments, we shall acknowledge you. Ques: Can this Booking Confirmation Amount and Booking full balance amount be paid via Payment gateway on website for Indian Customers? Ans: Yes, but in that case 2.5% Gateway charges is applicable on the paid amount. It is better to add our Indian bank account as a beneficiary & transfer via net banking or Cash deposit. Cheques shall be acknowledged once processed & clear. Ques: Would you give us any receipt of the Booking full balance amount? Ans: Yes, we shall issue only 1 single Invoice after the full payment received. For the intermediary payments, payment receipts are sent on your email id as the confirmation of payment received. Ques: Do you give Invoice & Vouchers as soon as you receive full payments? Ans: No. Invoice takes usually 3-4 working days after the full payments. Vouchers are normally provided 7 days before the travel date. Ans: At first full amount is charged and later converted in EMI normally within 10 working days. Please contact your card issuing bank in case 10 working days have passed and transaction has not been converted to EMIs. Ans: The issuing bank will receive EMI request after at least 3 working days of the transaction. Then status of transactions can be provided by issuing banks. Ans: Please contact your card issuing banks in-case 10 days have passed and transaction has not been converted in EMI. Conversion of transaction into EMI is at the sole discretion of card issuing bank and can also be rejected in unfortunate circumstances. Ans: Please check transaction date and customer bill generation date, if the period is less than 10 working days then customer needs to speak to issuing bank to determine how much to pay. The bank might convert the EMI at a later date and change bill payment. Ans: The issuing bank charges interest per EMI transaction. The interest rates are decided by the bank and are displayed at the time of completing the transaction. Ans: Customer needs to pay full amount of the transaction to bank, since EMI facility is at sole discretion of the issuing bank.